Peter Laslett CBE FBA (18 December 1915 – 8 November 2001) was an English historian. Born Thomas Peter Ruffell Laslett and educated at the Watford Grammar School for Boys, Peter Laslett studied history at St John's College, Cambridge in 1935 and graduated with a double first in 1938. During World War II he learned Japanese and worked at Bletchley Park and Washington decoding Japanese naval intelligence. It was at Bletchley Park that he met his future wife, Janet Crockett Clark, whom he married in 1947. Returning to Cambridge in 1948 with a research fellowship at St John's College, Laslett edited Robert Filmer's political writings (Patriarcha and Other Political Writings, 1949). According to noted historian J.G.A. Pocock, it was with this work that Laslett provided the initial inspiration for the 'Cambridge School' of the history of political thought, the methods of which are now widely practised throughout the profession. Laslett combined such academic activity with a lifelong concern to engage a wider audience. He worked simultaneously as a BBC radio producer for the Third Programme. One product of this desire to reach a wider audience was his pathbreaking and highly-popular book The World We Have Lost: England Before the Industrial Age (1965; US edition, 1966), issued in a second edition in 1971 and in a retitled third revised edition, The World We Have Lost: Further Explored (1983; US edition, 1984). Simon Mitton credits Laslett with having launched in 1948 the radio broadcasting career of the astronomer Fred Hoyle. In 1953, Laslett was appointed a university lecturer in history at Cambridge, and was elected a fellow Trinity College in the same year. He continued work in the history of political theory, discovering Locke's library and demonstrating (against the accepted account) that John Locke's Two Treatises on Government had been written prior to the English "Glorious Revolution" of 1688–9, remarking that the "Two Treatises is an Exclusion Tract, not a Revolution Pamphlet." Laslett published an edition of the treatises in 1960, subsequently reprinted many times, which is now recognised as the definitive account of these pillars of modern liberal democracy. From 1957 he founded and co-edited Philosophy, Politics and Society, a series of collections on political philosophy. Laslett took up an entirely different line of historical research from the early 1960s. Trying to understand 17th-century listings of the inhabitants of Clayworth and Cogenhoe, Northamptonshire, he became persuaded of the need to pursue historical demography more systematically. In 1964, Laslett and Tony Wrigley co-founded the Cambridge Group for the History of Population and Social Structure. With funding from the Social Science Research Council, the Cambridge Group worked alongside amateur volunteers on local records, and established the journal Local Population Studies. Laslett's practical reformism found an outlet from the 1960s in his efforts, together with Michael Young, to develop the Open University. In 1963 he ran a series of 5 programmes on Anglia Television, the "Dawn University", which attracted a great deal of attention although the funding had to wait two more years until Harold Wilson took up the idea. When told of his family history of Kent yeomen back to 1600 he looked it over and said "Good. Not a gentleman in 400 years." 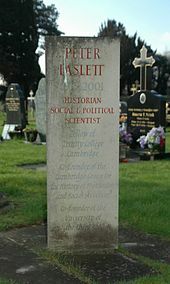 Laslett was Reader in Politics and the History of Social Structure at Cambridge University (the title reflecting his own unusual mix of historical interests) from 1966 until retirement in 1983. At this point, his interests turned to the historical understanding and practical betterment of the elderly. Laslett played a pivotal role in founding the University of the Third Age in 1982. He died in 2001, aged 85, and was interred at Wolvercote Cemetery in Oxford, and was survived by his wife Janet, sons George and Robert, and grandchildren, Vivian, Alden and Claire. His fine library of early printed books by and about Filmer, Locke, and political thought (including political economy) was sold by Quaritch in 2006. Richard Smith, ‘Laslett, (Thomas) Peter Ruffell (1915–2001)’, Oxford Dictionary of National Biography, online edition, Oxford University Press, January 2005; online edition, May 2006. John Dunn, Tony Wrigley, ‘Thomas Peter Ruffell Laslett (1915–2001)’, Proceeds of the British Academy, Volume 130, Biographical Memoirs of Fellows IV, edited by P. J. Marshall, pp. 109–129, Oxford, Oxford University Press, 2005. ^ Mitton, Simon, Fred Hoyle a life in science, p. 125, Aurum Press, 2005. ^ Laslett, "Introduction," in John Locke, Two Treatises of Government (Cambridge: Cambridge University Press, 2005), p. 61. ^ Briggs, Asa (1995). The History of Broadcasting in the United Kingdom:. Volume V: Competition. p. 476. Retrieved 24 February 2016. ^ "Laslett: The World we have Lost — Faculty of History". Hist.cam.ac.uk. Retrieved 15 January 2019. ^ "Eversley, David Edward Charles : Overview". Worldcat.org. Retrieved 15 January 2019. ^ "Obituary: David Eversley". The Independent. 13 July 1995. Retrieved 15 January 2019. ^ "Richard Wall - A Tribute" (PDF). Continuity and Change. Cambridge University Press 2011. 26 (2): 139–147. 2011. doi:10.1017/S026841601100018X. Retrieved 15 January 2019. ^ "Kenneth Wachter, Department of Demography, U.C. Berkeley". Demog.berkeley.edu. Retrieved 15 January 2019. ^ "ScienceDirect". Sciencedirect.com. Retrieved 15 January 2019. ^ Wall, Richard. "Family Forms in Historic Europe by Richard Wall". Cambridge Core. Retrieved 15 January 2019. ^ "Aging in the Past". Publishing.cdlib.org. Retrieved 15 January 2019. ^ "Lloyd Bonfield - Full-Time - Faculty". Nyls.edu. Retrieved 15 January 2019. ^ "Department of Geography, Cambridge » Richard Smith". Geog.cam.ac.uk. Retrieved 15 January 2019. ^ "Keith Wrightson - Department of History". History.yale.edu. Retrieved 15 January 2019. ^ Bonfield, Lloyd; Smith, Richard M.; Wrightson, Keith (15 January 1986). "The World We Have Gained". archive.org. Retrieved 15 January 2019 – via Internet Archive.